The Common Market, the Eurovision Song Contest, the European Cup, ‘Jeux Sans Frontieres’ and the European Capital of Culture – initiatives hatched on the continent with the admirable aim of creating a greater understanding and sense of brotherhood between the European nations and thus making us less likely to go to war with each other; that’s the intention in the beginning, anyway. Unfortunately, these concepts tend to get a little overblown and bloated thereafter, something that certainly applies to the first three. The European Capital of Culture is the newest innovation, one celebrating its thirtieth anniversary this year. Ironically, considering more recent events, the European Capital of Culture was conceived by Melina Mercouri, the then-Greek Minister of Culture, and Athens was the first city awarded the title in 1985. As far as European cities go, it seemed an apt choice. Subsequent obvious choices such as Florence, Amsterdam, Berlin and Paris were no great surprise, though the first British city to receive the accolade was, rather unexpectedly, Glasgow in 1990. Since then, only Liverpool (in 2008) has scooped the prize in the UK. As the birthplace of the most enduring cultural gift to the nation of the past fifty years – in the shape of John, Paul, George and Ringo – the choice of Liverpool was perhaps understandable; and it’s undoubtedly a feather in the municipal cap, with the publicity bringing in handsome investment that usually necessitates demolition. It does make one wonder what definition culture falls under, however. Does it equate with expensive new civic edifices – libraries, art galleries, theatres, music venues – or does it equate with corporate sponsorship and the overnight erection of ‘luxury apartments’ beyond the means of most citizens of the selected city? In the case of the former, every metropolis that grew on the back of the Industrial Revolution provided its populace with such amenities in the nineteenth century; as far as the latter is concerned, it often amounts to little more than window-dressing for the wealthy tourist. I wonder how many of the economic benefits brought to Liverpool in 2008 stretched to some of the less easy-on-the-eye areas of the city, most of which have been in decline for the best part of forty years. However, the positive publicity Liverpool received in 2008 inspired the Department of Culture, Media and Sport to concoct a British equivalent of the ‘Europe Fixed It For Me’ badge, name of UK City of Culture. The first winner in 2013 was Londonderry. As a nod to the healing of deep, ancient wounds, Londonderry’s winning ticket was credited to Derry-Londonderry, and it’s unarguable that the awarding of the title was a triumph for a city that just twenty-five years earlier was still a byword for bombs, bullets and bloodshed. The sectarian enclaves of the city with two names remain divided, but the prestige of being the inaugural winner of this new title certainly helped banish the lingering image of marching Orangemen and stone-throwing Catholics in tank-tops. The lifetime of this newcomer to the British cultural landscape seems to have been established as four years. The next holder of the title will be Hull as of 2017. Formerly one of the UK’s premier ports, the post-industrial isolation of Hull on the Eastern edges of Yorkshire may well seem less so if the country’s aesthetic eyes focus on it, yet no amount of superficial surface gloss can paper over the cracks in a city centre abundant with boarded-up shops. Mind you, as far as the European Capital of Culture goes, it was recently announced that the UK will be awarded it once again in 2023, a date that sounds in the far-flung future from the hindsight of 2015, but is only eight years away. And so we come to the thrust of this here post – the first contenders out of the starting blocks are Dundee and Leeds. I can’t speak for Dundee; my knowledge of the place is limited to DC Thompson, the cake, and The Average White Band. As far as Leeds goes, however, I feel I can comment on a ‘Northern Powerhouse’ via familiarity bred by contempt. Again, one cannot help but wonder as to what the definition of ‘culture’ is that qualifies cities as contenders. In the past couple of years, there has been relentless redevelopment in Leeds, albeit restricted to the city centre – shopping malls, office blocks and riverside apartments. Not much of this redevelopment has extended to those neighbourhoods on the fringes of the city centre such as Harehills, Lincoln Green or Little London, which remain the kind of urban armpits that every large city forgets because they don’t fit the facelift. No doubt as the Leeds bid gathers pace, various cultural names will be evoked – Alan Bennett and Henry Moore being the most prominent, I should imagine. The fact that both achieved greatness only after they had escaped Leeds will probably be conveniently overlooked. A walk through the redesigned quarters of Leeds city centre is like a walk up and down an Escher staircase; you’re fooled into thinking something interesting loiters around the next corner, but when you get there you feel like you’re back where you began. The only sights that impress are ones that have been there forever. Leeds Town Hall, with its superb blend of early nineteenth century Classical revivalism and Victorian Gothic, is a notable contrast to the more architecturally vapid buildings to have sprung up around it recently; and the genuine culture of a city tends to be buried beneath the twenty-first century cathedrals to commerce that have gate-crashed the skyline. A few months back, I produced a video short called ‘Leeds: A Dirty Old Town’, one that featured Jimmy Savile and Don Revie, two iconic figures of Leeds past that are not exactly loved nationwide, even though both served to put the city on the map with their own distinctive blend of belligerence and bluster. If I think of Leeds, I think of them; but don’t expect images of either (especially Savile) to feature in the bidding process for the European Capital of Culture honour. So, what does Leeds put forth as its eligibility for this coveted title? It certainly can’t be pop music. The Kaiser Chiefs? Do me a favour! I therefore come to the conclusion that the Leeds entry into the race is based largely on the money spent making the city centre resemble a dwarf Canary Wharf, the latest addition to which is the Vodafone Arena, another venue named after a corporation with no connection to the city and one that hosts all those ‘rock legends’ that were big in 1987. With the exception of the International Piano Competition, there’s little evident home-grown culture to commend Leeds to the committee that decides which town is awarded the coveted title. It certainly isn’t a city populated by erudite individuals in jaunty hats and cravats debating the merits of Monet and Manet. Has the European Capital of Culture already become one more excuse for an EU piss-up? The premise seems to be that if the local council hand over huge plots of land to private developers so they can plant row-upon-row of gleaming skyscrapers that render their respective cities indistinguishable from one another, they are eligible for inclusion, regardless of the fact that old, idiosyncratic buildings in neighbourhoods housing the kind of authentic character that represents actual local culture tend to be bulldozed to make way for such Lego-like carbuncles. What price culture? The death of it, if Leeds is anything to go by. I thought it was only the Americans who didn’t get irony. Any ‘culture’ label applied to Glasgow, Londonderry, Liverpool and Hull can only be classified under the ‘Ironic’ heading. As such, why not Leeds ? Or indeed Rotherham, Rochdale, Bradford, Hartlepool, Staines, Basingstoke, Croydon, Basildon, Southend, Tower Hamlets, Margate – all places where the nearest you could get to culture would be in a yoghurt pot. Add your own preferred dump to the list. The bottom photo of the Gallery of Modern Art shows a statue of a man on a horse outside (as you can just make out). The man usually has a traffic cone on his head. Sometimes the horse does too. Even the neds in Glasgow appreciate art and want to contribute in their own witty way. In fact, the statue with traffic cones atop is more interesting than half the exhibits in the modern ‘art’ museum and it means nobody parks on top of the statue. Not intentionally, anyway. Are these ‘culture’ accolades a continuation of that post-war ‘piss-ups for officialdom’ anachronism which is “Town Twinning”? The likes of “Little Bumpstead – Twinned with Florence”; an opportunity for insignificant councillors to enjoy a beano at the expense of others. At least the citizens of one Perthshire community, Dull, have a sense of humour – twinning with Boring. Rumour has it, they’re seeking a troilistic relationship with the New South Wales community, Bland. I forgot about ‘Town Twinning’, but I think you’re right in drawing parallels between that and the Culture Capital tag. A small number of European cities stand out as genuine cultural oases, but you could count them on the fingers of one hand, really. My local town used to be twinned with a German town AND a French town, but now only the French one seems extant. Fings aint wot they used to be. Gillingham, the compost heap in the Garden of England from which I emerged, was twinned with Yokosuka, Japan. Now Gillingham has been subsumed by the dung heap that is Medway, the official relationship is between Medway and Yokosuka. The partnership was founded because the first English person to land in Japan, at Yokosuka in 1600 was Gillingham born and bred Will Adams. Not that it ever did us any good as far as I can see – no gleaming investment in factories or retail or anything, not even school exchanges. But the glamour, oh, the glamour. Could’ve been worse, I suppose. Is any town in England twinned with Hiroshima? The irony is I’m sure we could all nominate half-a-dozen UK towns that could be twinned with Hiroshima. In fact, I’m pretty certain our landlady could – and they’d all be in Wales! Aside: When I was learning Japanese, I was told this was because they have neither letter, but a single one which falls midway between the two. Those wags who consider some in Norfolk suffer inbreeding, suggested Norwich be twinned with Norwich. 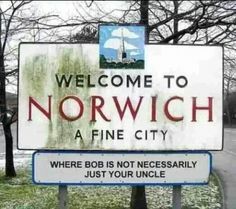 “Welcome to Norwich” sign, to remind the locals ….. I missed that sign when I was there! Norwich be twinned with Norwich. No one in Norfolk would consider that a remotely strange suggestion. Look, we’re talking about Norwich here…the city whose main railway station isn’t even in it. I kid you not. The idea of Norwich twinning with the town of Thorpe St.Andy’s, where the Norwich Central station is, seems eminently sensible. Our local council wasn’t too impressed when I suggested they should twin with Dignitas. At least the travel costs for their Swiss visits would only be one-way. I remember laughing my head off when I discovered people from Leeds are supposedly called “loiners”. Hard to imagine that continuing. Time for a revamp and leave the past behind. I was wondering what Leeds was actually for, in the first place? Liverpool and Hull were ports and lived off the Irish and fish respectively, but it turns out Leeds was all about wool. What was it Johnny Rotten said about No Future? Presumably if America was England, Detroit would be in the running as City of Culture…. I never heard ‘loiner’ till I was well into my 20s. Liverpudlian and Mancunian make sense as labels, but loiner? I don’t think anyone uses it bar the loiner branch of Professional Yorkshiremen. Loins Club… Become a proud member now!! Leeds wasn’t really about wool, that was Bradford’s job – Leeds concentrated on the ‘making-up’ of garments from the wool and cotton sourced/produced elsewhere (Montague Burton etc). Also lots of heavy engineering to support the other northern industrial towns. And, of course Tetley’s Brewery. I remember going to the “Futurama” festival at Leeds in 1979- a two day event in a shoddy warehouse called the Queens Hall, where we ended up sleeping wrapped in bin-liners on cardboard boxes ripped apart to provide a little protection from the piss awash floors. On the plus side – Soft Cell’s first public performance (including a cover of Black Sabbath’s “Paranoid”), Orchestral Manouevres In The Dark, A Certain Ratio, Cabaret Voltaire, Echo and the Bunnymen, Teardrop Explodes, Joy Division, PIL, Punishment of Luxury and all sorts of other odd-sods. If they re-constituted that – minus the piss deluge – I’d give it a chance. I remember going to a circus at the Queen’s Hall when I was about three or four. It used to be some sort of terminus for trams or something. Even The Beatles played there in ’63 and my dad was part of the impromptu security team keeping the mania at bay. He was there when the band arrived and he told me Lennon took one look at the venue and said ‘Is this it?’ in an unimpressed fashion. The Hall, like Lennon, is now long gone. I for one have never heard of this corporation…I wonder if the international telecoms giant Vodafone has tried to prevent the venue’s sponsor using such a confusingly similar name? Apparently they look exactly the same when you hear their name. But my question would be: What the phuck is a fone? It shall be changed. Perhaps it reflects my fanatical interest in the ultimate object of desire that is the mobile. Here in Hull, the ‘City Of Culture 2017′, we are in a curious position – some are excited for the ‘opportunities’ that will come to the City and some of us are more pragmatic. The city has a stench not of ‘culture’ but of decay and decline, of call centres and poundshops. Step out of our impressively facelifted train & bus station (to the right of which is a 00’s shopping centre that has killed the rest of the city centre) and you’ll be faced with a huge branch of Poundland accross the road (formerly a big C&A). The ‘plans’ for City Of Culture Spend hinge mainly around the ‘marina’ area of the city centre edge – where the creative elements of Hull have managed to make something approaching a cultural ‘scene’, but already ambitious plans – such as some kind of advanced pedestrian crossing over the A63 to get to the small area – are being thwarted. The council have been given funding to ‘facelift’ the pedestrianised streets of the dying City Centre, but every other shop will remain empty and unwanted. The busy nightlife “socially engineered” out of the City Centre by the council from the late 90s on remains quarantined in a small (mainly residential area) not far from the University. The decent (and sizeable) council estate they decided to bulldoze in order to replace it with privately-funded development (only for the companies concerned to go out of business and funding withdrawn) will remain “sites”. What will probably change, sometime after 2017, is the practically-bankrupt Kingston-upon-Hull City Council are forced to become part of the East Riding of Yorkshire Council… then and only then might some progress be made. As it stands, Hull is the product of socialist social engineering which, despite boasting high profile MP’s of the New Labour years such as Alan Johnson and John Prescott, has been left floundering even more than the rest of the sorry country. My local High Street is the same. But why is the High Street even still there? Why has it not all been converted into a bijou Hipsterville? Because the local planning have it designated for “shopping and business” use and thus it degenerates into a shuttered boulevard of tattoo parlours, betting shops, charity shops and civic initiatives such as food-banks . Meanwhile the superstores across the rail-tracks are trading bigger money than the High Street ever did, or could. If the local councils want us to live in the 1950’s they should at least be consistent and turn down the big money from the Developers and abandon the grandiose cycle and bus lane schemes that the supermarket barons happily sanction in order to get their new Megastore with vast acres of car-parking built and in the cash-flow from the enthusiastic citizenry who themselves leave the council to jabber with the “special interest groups” and try to get on with their lives in the 21st century. For once I have to disagree, I spent a couple of days in Leeds late last year and was really impressed with the city, it’s people and the architecture. From my perspective, the city centre was easy to walk around and the architectural mix between old and new had been handled well. There was no shortage of galleries and museums to wander around, and although there is the familiar problem of seeing the same old brand names everywhere, Leeds still retained its character – I enjoyed my time there and look forward to visiting again. Indeed – what is each city being measured against? Too mach fakkin’ perspective! Alan Bennet, Henry Moore, Soft Cell, The Kaiser Chiefs, Selwyn Froggit, The Beiderbecke Trilogy, Thomas Chippendale, Sir Len Hutton, Malcom McDowell, Peter O’Toole, Mel B, Jeremy Paxman, Keith Lemon and Earie friggin Wise… A veritable cornucopia of culture to rival anywhere.. Oh wait and Jimmy Saville.. That’s kicked Leeds bid into the shitter right there..
To be honest, I think The Kaiser Chiefs, Mel B and Keith Lemon managed that without Savile! Keith Lemon wanted to be Jimmy Savile in 2012. Must be the Pennine water that does it. Any talk of Cities of Culture always reminds me of an episode of Taggart, when Mark McManus in the title role comments on Glasgow being the City of Culture “When I was a boy culture was what grew on the walls”. Pet, be about time you wrote a piece about a town or city in England. Fill your thermos with buckfast, wrap a 1/2 ounce of “Silver Slapper” (generic dwarfism for blackmarket rolling tobacco) up in a £5 tesco’s voucher , grab your notebook and head down south into England. Go all Alistair Cook on Portsmouth,go gonzo on Reading, experience the mean steets of Hastings and discover a new will to live in London and lose it again in Slough. I, for one, get bored of reading about places so far North that even the Night’s Watch wouldn’t visit them and , excepting the Zombie Apocalypse, neither will i. The last city outside of the north I visited was Norwich. Delightful town centre, I thought – and the big-eared boys didn’t bother me at all! I sometimes wonder if these events are a bit like an old fashioned royal progress. The Field of the Cloth of Gold is set up; the famous turn up and swan about a bit, appear at entertainments; then clear off and the locals are left with the litter, trampled crops etc…. You don’t get made into a cultural icon, you have to tender a bid, or rattle the can like a Greek. If you would have asked me in the 1970s, I would have said Leeds for the City of Culture. As a boy, I couldn’t understand how so many bands came from that area. The vocalists are usually the most talked-about members, so whether I was watching Top of the Pops or listening to the wireless (sic), the DJs would often mention the Leeds singers. That’s what I thought they meant. I was always confused also whenever I heard a Welsh person talking about, so it seemed to my ears, something called a ‘Male Boys Choir.’ This led to me asking a Welsh chap if this meant that they had a ‘Lady Boys Choir’ too? Much misunderstanding ensued! You’re the first person that’s admitted the same Leeds confusion. Not that I have discussed it with many people, but a friend reminded me of it the other day; he thinks it’s funny. I expect Lady Boys Choirs will come into existence one day, if they haven’t already. Coming to a Civiv Centre near you very soon I imagine. Phillip also admits that 70% of the audience are still female, but says men are warming to the Lady Boys as the years roll by. I enjoyed Glasgow’s City of Culture, it was really good but sadly as soon as it was over everything just went back to ‘normal’ it would have been nice if they had kept some of the attractions going. In other words, the circus came to town and then buggered off again! You never know,by 2023 ,the truth as regards Jimmy Savile ,may well be out there. We live in hope, I suppose.